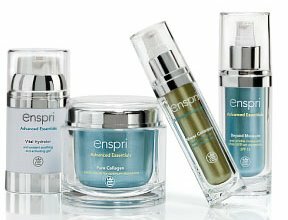 Derived from the words enliven and inspirit, our name describes the effect Enspri products immediately have on the skin. And how customers tell us they feel after using our products. To achieve that effect means using only the highest quality ingredients. While employing the safest, yet most effective delivery methods. Until recently, Enspri products have only been available through dermatologists and skin care professionals. But we have expanded our line of Advanced Essentials to maximize the benefits between professional visits. Giving our customers the complete Enspri experience.